Welcome to your mountain home. 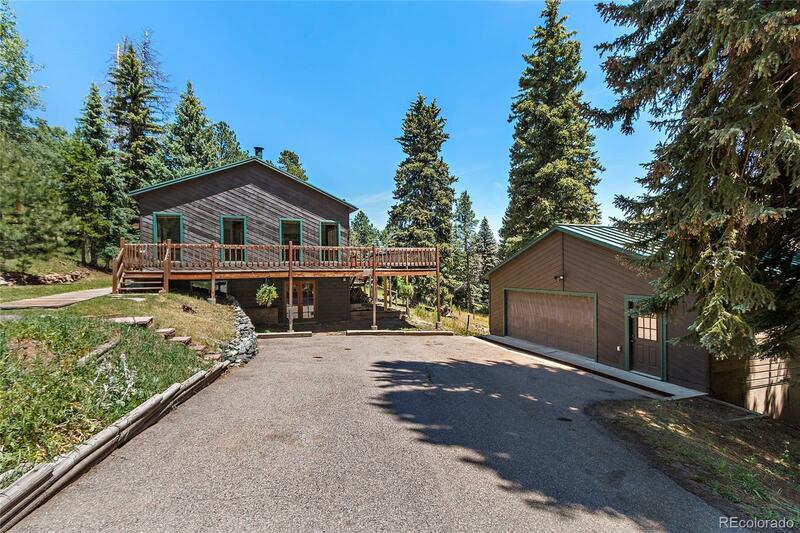 This house is conveniently located to both Evergreen & Conifer! It sits on a usable flat 1 acre lot with a fenced area for your pets, a paved double driveway, over-sized 2+ car garage with extra storage above! As you enter the front door, you walk into the main living room, with a wood burning fireplace, vaulted ceilings, and abundant sunshine! The main living area opens to the updated kitchen with high end stainless steel appliances, including a Viking gas cook top stove & oven, granite tile counter tops, kitchen island, built in pantry, eat in kitchen /dining area and access to a wrap around deck! What more can you ask for? You have plenty of room for friends and family with 4 bedrooms and 2 full baths and a hot tub to enjoy! Set your private showing today.